On this cycle journey we ride down the magnificent glacial valleys of the South Tyrol, past the jagged backdrop of the Dolomites to the beautiful setting of Lake Garda. 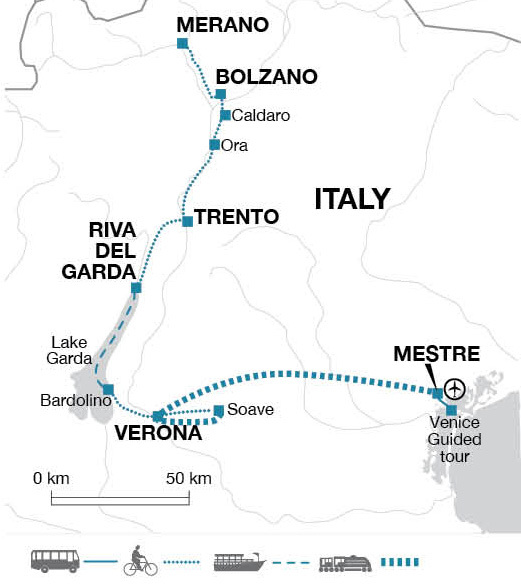 Cross Lake Garda to explore the grand architecture and cultural heritage of Verona and Venice, where our journey ends. Along the way we sample the local wine and stay in charming and elegant alpine towns. Our journey begins in Venice Marco Polo Airport from where we drive approximately three hours to our hotel for the night in the Alpine town of Merano. Located in the South Tyrol, Merano enjoys a fine setting sat in a basin at an altitude of 325 metres surrounded by mountains over 3000 metres high. It has been famed as a spa town since the 9th century and only became part of modern Italy after the First World War. Prior to this it formed part of the Hapsburg Empire which explains the prevailing Germanic culture, language and food in this region. This evening there will be a short briefing by our Tour Leader about the week ahead. After breakfast and ensuring everyone is happy with their bikes we commence our first cycle ride, much of which is flat, as we make our way to Bolzano on a bike path amidst alpine meadows. We leave Merano then make our way down the scenic Adige Valley cycle path past endless vineyards and apple orchards, against a backdrop of Alpine mountains. We ride on this cycle path all the way to the town of Bolzano, the capital of South Tyrol. After arriving in the late afternoon there is free time to explore Bolzano and perhaps visit some of the museums or take the Funivia Renon (cable car) up the mountainside to enjoy spectacular views over the valley. Our total cycling distance today is approximately 35 kilometres (Total 100 metres ascent, 200 metres descent). This morning we continue our journey by bike from Bolzano to the impressive setting of Lake Caldaro on a longer ride. From the crystal clear waters of Lake Caldaro the ride follows the beautiful 'Strada del Vino' (wine road) leading through numerous wine-producing villages and along the way we plan to stop at a vineyard for an optional wine tasting. We then descend into the Adige valley and enter a bike path that takes you all the way to Trento. Along the way we may make a stop at one of the 'Bici Grills' (cyclists bar) and visit century-old villages such as Egna and Salorno. Please note that although the route is largely on the flat, it is not unusual to encounter headwinds that slow you down. For this reason there is the option to reduce today's ride by 24km by taking the train from Mezzocorona to Trento (approx 15 Euros per person depending on numbers, this must be arranged previously with the Tour Leader as the bikes need to be transported separately). We should arrive into Trento in the late afternoon. The town has an impressive setting in the Dolomites and within the town itself there are several interesting sites including Buonconsiglio castle, museums and other historical buildings. Our total cycling distance today is approximately 72 kilometres (Total 100 metres ascent, 150 metres descent). 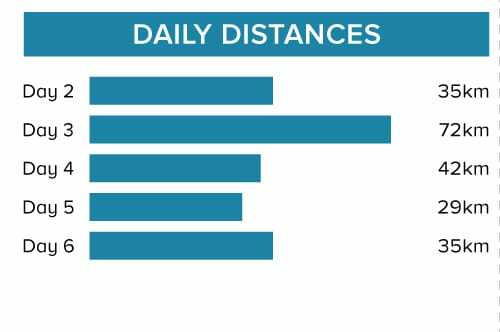 There is the option to reduce today's ride by 24 kilometres. We start the day with a very short bus ride from Trento to Cadine. Our cycle route leads us up and out of the Adige Valley, taking in superb views and a number of smaller lakes such as Toblino Lake which is dominated by a small castle. We continue on to the village of Arco - a famous rock-climbing mecca. The cycling today is nearly all along dedicated bike paths and towards the end of our ride we are rewarded with stunning views of Lake Garda. Upon arrival into the charming town of Riva del Garda town in the mid- to late-afternoon we check into our hotel. The rest of the day is left free to explore the narrow, medieval alleyways of the old town and its dramatic lakeside setting. Our total cycling distance today is approximately 42 kilometres (Total 300 metres ascent, 660 metres descent). We start the day with a relaxing and beautiful public ferry ride (2.5 hours) south across Lake Garda to the town of Bardolino. From the port we ride through town on regular roads for about two kilometres, after which we continue on small country roads which lead us to a bike path that we follow for the last section of cycling into Verona. Although we continue mostly along urban cycle paths the traffic levels inevitably increase on the ride into the city of Verona. We spend the next two nights in the beautiful city of Verona; the setting for Shakespeare's Romeo and Juliet. Over the next couple of days you will have time to visit the city's Roman amphitheatre, the Duomo, see Ponte Scaligero and enjoy the vibrant atmosphere in one of the several piazzas. Our total cycling distance today is approximately 29 kilometres (Total 250 metres ascent, 245 metres descent). Day 6 - Cycle to wine-producing Soave. Train return to Verona. Today we cycle to Soave mainly along quiet country roads, with sections of dedicated bike path and an interesting section alongside old irrigation channels (fossi) built in Roman times. The ride is generally flat with one steep hill (for about 1.5 kilometres) just before we reach the village of Colognola ai Colli. From here we cycle into the beautiful wine growing region of Soave, known particularly for its fresh, fruity and light-bodied white wines which are made mostly with the local Garganega grapes. The town of Soave grew up around its imposing medieval military castle, one of the best examples of castle architecture in Veneto. For a long period of time it suffered feudal quarrels, invasions and defeats and as a result has a rich history. The final kilometre or so of the ride, from Soave to the train station in Bonifacio, encounters unavoidable busier sections of road. We return to Verona by train then cycle once again through the city to our hotel, leaving some free time in the afternoon to explore the city. There is the option of a two hour guided tour. Our total cycling distance today is approximately 35 kilometres (Total 200 metres ascent, 235 metres descent). After breakfast we catch the train to Venice where we enjoy a full day for sightseeing. The Explore Leader will provide an orientation tour and can arrange an optional two hour guided tour of the city for those interested. For those interested in experiencing Venice in a totally different way there is the option to take a guided kayaking tour of the city and lagoon, it lasts around 1.5 hours and includes the Canal Grande and other small canals. The rest of the day is free to explore at leisure. At the end of the day we make our way back to Mestre by bus where we spend the night. Mestre is located on the mainland and connected to Venice by a short bus ride. The tour ends in Mestre this morning after breakfast. Temperature and rainfall is more or less the same for all places visited, with the exception of Verona where it rains less in July and August. In spring/autumn rain tends to be lighter and more prolonged while in summer it comes down as shorter heavier downpours. In summer the Adige valley is very hot and temperatures are normally above 30°C and often goes over 35°C. If staying at the A O Hostel in Mestre please note this large accommodation has numerous twin and single rooms with private en suite facilities as well as dorm rooms, and that these style rooms are located on different floors. Visas are not required by UK, EU Nationals, Australian, New Zealand, US and Canadian citizens. Other nationalities should consult their local embassy or consular office. On this tour we cycle 189 km over five days (an average of 38 km per day) with optional extra 24 kilometres cycling. The terrain is virtually all on tarmac and 90% of the route is on dedicated cycle paths. We encounter traffic for short sections at the end of day 6. The route is generally a gentle descent with flat sections and occasional ascents; with a few steeper inclines on days 4, 5 and 6. The Explore Leader will cycle with the group every day and luggage is transported between hotels. Maps and route notes are also provided to cycle individually or in groups. We have graded the route as easy. Your included bike is a 21 gear custom made hybrid and will be the correct frame size for your height. Female and male frames are allocated accordingly when booking unless you specifically request otherwise. A rear pannier bag is included as well as the facility to fit your own pedals or saddle if you wish to bring them. The tour leader leads the rides and luggage is transported between hotels. We provide spare parts and take care of the day to day maintenance. All you need to bring is your own helmet.